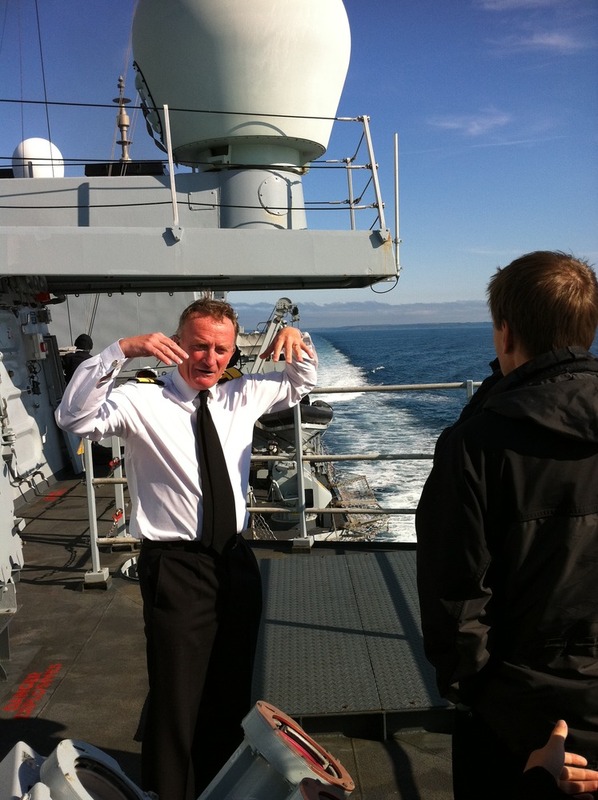 Two days with the Royal Navy & RNRMC – Digital Recruitment and me. 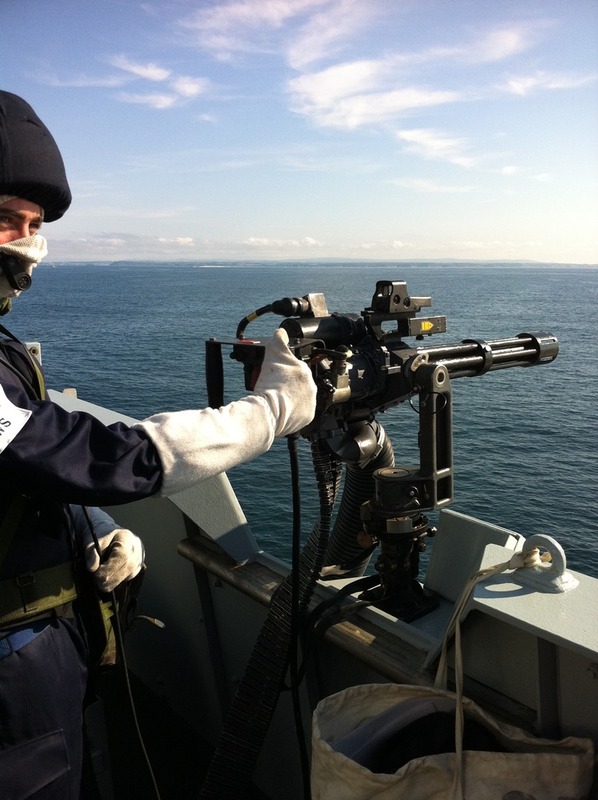 As you may have seen from previous blogs, Jobsite has a very strong relationship with both the Royal Navy and RNRMC (Royal Navy and Royal Marines Charity) and this week our Chairman, Felix and I were lucky enough to be invited to Devonport to witness a mock battle at sea called “Thursday War”. We arrived at Devonport Heliport on Wednesday to be greeted by officers of “FOST”, (Flag Officer Sea Training) where we were driven to the FOST HQ. After a safety briefing on how to escape from an inverted sea helicopter we went to Admiralty House where we enjoyed the excellent hospitality of Admiral Chris Stone CBE and his lovely wife, Helen. Over a fantastic dinner we chatted with distinguished Navy guests about the dangers of tackling Somali pirates, protecting our waters and maintaining safe shipping routes, subjects which we only really see through TV. My room in the 18th Century Admiralty house overlooked the garden, the end of which towered a huge ancient wall topped with rolls of barbed wire. I couldn’t help romantically thinking about all the famous Admirals who probably have stayed there over the 100’s of years….quite probably in my own room. We received a naval wake up call at 5:30AM for a 6AM breakfast and were aboard a Royal Navy transport vessel by 6:30 travelling out to HMS Argyll, a warship. En route, we passed many warships docked and couldn’t help noticing the very smart alignment of crew standing to attention on each ship (or submarine) saluting the Admiral who was chatting with us and interrupting the conversation with a return salute. The Admiral followed each salute with a huge shout of “Good Morning Cumberland” or whatever vessel name we were passing. 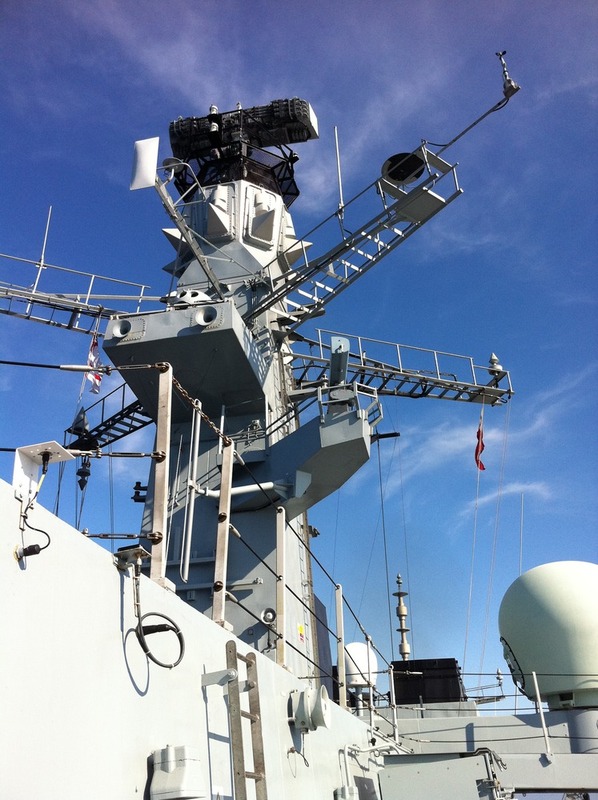 We arrived at HMS Argyll and walked on board via a huge gangway being careful to jump the last foot to make sure we didn’t fall between the vessels. I always thought the longjump practice at school would come in handy one day and following a successful leap we were welcomed aboard the warship by the Captain. The Captain had a small but very nice cabin where we all sat down and chatted over a cup of tea and a bacon roll. I was later to discover that the Captains cabin was enormous in comparison to anyone else (including officers). We didn’t have much time though as “Thursday War” was about to start and we were told that anything could happen. 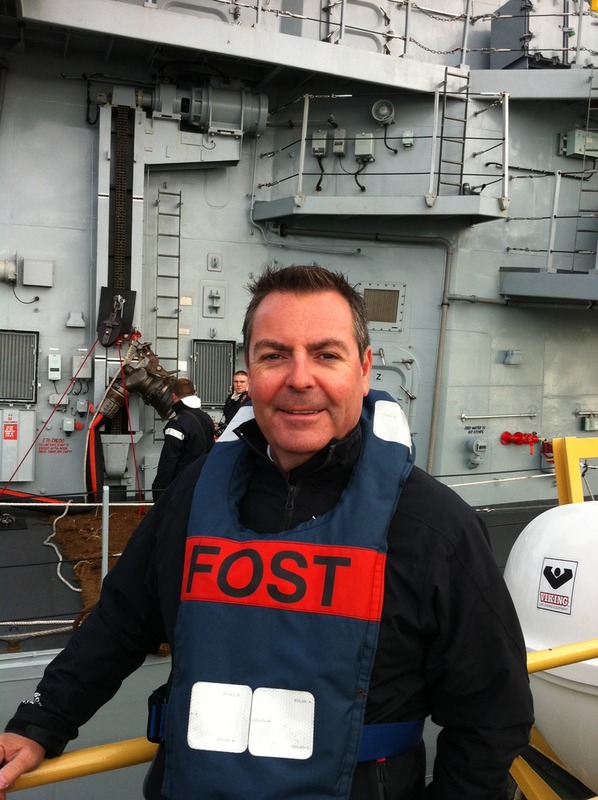 We joined the FOST team for an Admiral’s briefing where the language became totally complex as almost every other word seemed to be an acronym. The Admiral certainly knew what the team were saying as he was asking questions which appeared even more full of acronyms than those of the FOST team. Back at the Captains quarters, the Admiral tried to fill us in with a few of the coded messages and it appeared a little less confusing but the top and bottom of it was that there was about to be a huge amount of attacks and incidents on the ship we were sailing in. The ships company were going to be put under huge pressure and we were there to witness it. Almost immediately, Torpedoes and Missiles were on course for collision with HMS Argyll. We were under attack by a hugely agile military boat which zig zagged around us simulating a Somali Pirate attack. Following warnings, the boat continued to approach and we witnessed machine gunners stationed down the side of Argyll firing at the boat with 50 rounds per second. I think we won that battle and it left me thinking that I really need to keep out of the way of these warships when I’m doing my own pleasure sailing. To get on the wrong side of one would be a truly horrible experience!! We were later subjected to a fire on the bridge which became totally abandoned. Little did we realise at the time but the ship can be controlled outside the bridge as a backup which was very reassuring considering the speed we were going. As I stood there in a total blanket of smoke, I couldn’t help notice that whilst under attack, Argyll was zigzagging with incredible agility which was more reminiscent of a powerboat than a huge warship. Cameras were put away when we went to the ops room which is where the battle is being controlled from. It was like a scene from “Red October” with radar screens and flashing buttons controlled by a crowded team of the top brass. Everyone wore white masks and gloves to prevent skin burn from explosive flashes and it was kind of scary to see them all in action with all this hi-tech gear. “Torpedo coming in from 170 degrees” one person shouted at the top of their voice. The Admiral pointed out that these guys were having three conversations at any one time, an earpiece for two remote inputs plus the people around them in the ops room. Everything looked totally confusing but as far as I had witnessed, they were in the right educational hands with the FOST team doing the one-to-one training and observation. The battle ceased after several hours as we put on our “dry” suits to board the Royal Navy Helicopter. Taking off from the back of a warship was a surreal experience and pretty frightening to say the least. The Admiral had mentioned that the YouTube video with the Heli falling off the back of a warship ended up with several drownings and forms part of their training video collection on how “not” to “kit up”. The afternoon was equally fascinating and included a tour of HMS Tireless, a nuclear sub which had recently returned from a 10.5 month deployment. The cramped space of the sub was difficult enough for an hour or so but we just imagined what it would be like to stay underwater for months with 130 other men!! Our final tour of the day following a sandwich lunch in the Admirals office was a walkabout with Hasler Company. The work these guys do to help injured Marines is staggering and we were proud to take a good look around at all the equipment and facilities that Help for Heroes and RNRMC had provided them. It was clear to me that Hasler Company were doing a very important and fine job for our wounded Marines. with the RN, RM and RNRMC and look forward to helping them with their difficult recruitment challenges of the future. When I next hear news of our military in action on TV, I’m sure it will remind me of the privileged day we spent meeting our heroes and from what we saw, heroes they are.